David Orchard in an open-line talk on "Deep Integration with the United States"
"Megan and Morris in the Morning"
David Orchard speaks on "Politics and the environment: challenges and opportunities"
"Right at the Crossroads: Conflicting Visions of Conservatism in Canada"
What makes a conservative in Canada? Are "Red Tories" still relevant? What is the future of the Conservative Party? An academic examination of the changing political right in Canada from the perspective of two prominent conservatives, hosted by the Glendon Political Science Association Science Politique. David Orchard, Former Progressive Conservative leadership candidate, merger opponent and Jim Flaherty, former Minister of Finance and Deputy Premier of Ontario, Finance Critic. Admission free. All welcome. For more information: (905) 665-5742 jessynd@yahoo.com. A conference on private and public international law dealing with trade, human rights, security, the environment, health law and intellectual property, the legitimacy of international courts and tribunals, and the practice of international law, with speakers from across North America, among them Paul Heinbecker, Former Canadian Ambassador to the United Nations (keynote address, Friday, February 25, 6:10 p.m.) and Alex Neve, Secretary-general, Amnesty Canada (opening speech, Saturday, February 26, 9:30 a.m.) For full list of panels and speakers please see http://www.cilsc.org/Speakers%202005.htm. Sponsored by the International Law Societies of Osgoode Hall and the University of Toronto, and the Journal of International Law and International Relations. David Orchard, Robert Wisner (Litigation Practice Leader, Appleton & Associates LLP), and James McIlroy (President, Counsel of Public Policy, McIlroy & McIlroy): "The future of NAFTA Chapter 11 and bilateral investment treaties." Moderator: Lawrence Herman, Former Canadian Representative to the International Trade Advisory Committee Task Force on Trade Policy. Early registration before February 14, 2005: $10, full-time student; $20, non-student. Late registration, after February 14, 2005: $15 full-time student, $25, non-student. Friday, February 25 optional dinner: $40. To register, please download the conference registration form or contact Jennifer MacArthur, tel 905-616-4309, info@cilsc.org. 8 a.m. - 5 p.m. Canadian Organic Growers (COG), Ottawa Chapter, Eco Farm Day 2005, Conference and Trade Show, "Agriculture's positive environmental impact." 9 a.m. David Orchard, keynote speech, "Organic agriculture - what it can offer Canada." All welcome. All day conference registration: adults $45 advance, $55 at the door ($10 discount available by joining COG), seniors and students $20, children 12 and under $10. For more information, see http://www.cog.ca/ottawa/EFD_2005_brochure.htm. For additional questions, and to register, contact Faith Phllips at 613-525-4114, faithphillips@hotmail.com. David Orchard on "Canadian sovereignty in a globalized world." Free admission, all welcome. Sponsored by the Department of Political Science, University of Western Ontario. For more information please contact afuyarchuk@hotmail.com. David Orchard speaks to the Canadian Club of London luncheon meeting: "What kind of Canada does the world need?" Sponsored by Broadhead & Associates Financial Planners, Rembrandt Homes Inc. and Union Gas. All welcome. Canadian Club members $20, guests $25. For more information and to reserve early, please contact 519-471-6369, connect@canadianclublondon.ca, http://www.canadianclublondon.on.ca. "Politics, organic agriculture and the environment," an open forum with David Orchard, Green Party Deputy Leader Tom Manley, and environmentalist Philip Penna. Moderator will be Helke Ferrie, writer and food systems commentator. 12 noon, David Orchard introduces keynote speaker Pierre Gaudet, President, Federation of Organic Agriculture Producers of Quebec/L'Union des producteurs agricoles (UPA) www.upa.qc.ca who will speak on "Organic Organizational Structure in Quebec." For more information, please contact SOD President Arnold Taylor, tel 306-252-2783, taylor.organic.farms@sasktel.net or SOD Administrator Lester Wyatt, tel 306-468-2218, lester.wyatt@saskorganic.com Cedar Lodge accommodation, tel 306-492-4999. Directions: drive east from Dundurn, turn across the causeway and up the hill overlooking Blackstrap Lake. 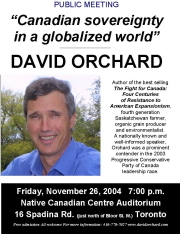 David Orchard on CBC Radio Alberta "Wild Rose Forum"
David Orchard on "Canada in a globalized world"
1455 de Maisonneuve W., Montreal, P.Q. David Orchard shares the podium Dr. David Suzuki who will speak at 7:00 p.m. EST (4:00 p.m.) "Canada and the environment in the 21st century." 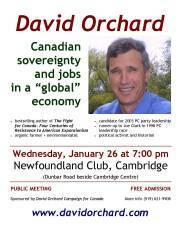 David Orchard's speech will include how NAFTA is affecting Canada's ability to protect the environment. There will be a substantial question period. Both David Orchard's and David Suzuki's speeches will be webcast LIVE on the internet -- go to http://www.csu.qc.ca/ and click on the link in the blue banner that says live web cast. David Orchard speaks on "Straitjacket for our dreams - Canadian sovereignty under free trade." David Orchard speaks on "Free trade, B.S.E. and Canadian sovereignty"
"Canada -what is its historical mandate in North America and the global community?" A web streamed panel discussion with David Orchard; Richard Julien, professor of curriculum studies, University of Saskatchewan; and Anthony Hall, founding coordinator of "Globalization Studies," University of Lethbridge and author of The American Empire and the Fourth World. This University of Lethbridge credit course seminar is simultaneously a live chat which interested people are encouraged to join. For more information please go here or e-mail Professor Anthony Hall at tonyhall@shaw.ca NB: to download Quicktime 6 needed to view the webcast, please click here.